The Suspension Pump is a handheld, compact pump for the newly designed air suspension motorcycle forks; specifically, the KYB PSF (Pneumatic Spring Fork) motorcycle fork. Durable, compact design allows for simple and precise adjustability. 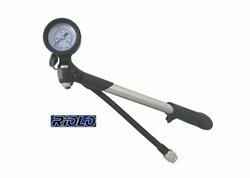 The motorcycle suspension pump also features an air control button to bleed excess air from the fork making it easy to set exact pressure. Built in air pressure gauge shows accurate air pressure up to 50 PSI (3.5 Bar). Swivel valve for easy access to fork caps. . Quality construction - body made from durable 6063 Aluminum. Image reflects the exact shape.